Using consistent reasoning simply means that you use the same type of thinking or the same logical structure across your various views and arguments. In other words, the arguments that you use to support one position cannot conflict with the arguments that you use for another position. This is a fundamental requirement of the law of non-contradiction. It is, therefore, vital to make sure that your views are internally consistent, and pointing out inconsistent arguments can be an extremely powerful debate tool (it’s actually among my favorites). Nevertheless, many people struggle to spot conflicts among their views, and when those inconsistencies are revealed to them, they often have trouble processing the problem. For example, on my blog’s Facebook page, I recently shared the image above, and I got all sorts of bizarre responses, such as the ones below. All of these responses represent a fundamental misunderstanding of the argument being made in the meme. The argument is about the reasoning behind anti-vaccer’s claims, not the facts. In other words, when you make analogous arguments, it is the logic which must be analogous, not the topics of the arguments. Given that so many people seem to struggle with this, I am going to explain why consistent reasoning is so important, and explain an easy method for both testing for consistent reasoning as well as pointing out inconsistencies in people’s arguments. I will begin with some neutral examples, then move on to some real life examples (including the aforementioned meme). Before I can explain what is meant by “consistent reasoning,” I have to review the basic structure of an argument. All arguments consist of premises and a conclusion. The premises are the known facts. They are the evidence that you are bringing into the debate, and the conclusion is the point that you are attempting to prove. If the argument is a good argument, then the conclusion will follow necessarily from those premises. In other words, the structure of the argument will lead from one premise to the next in a way that makes the conclusion inevitable (i.e., if the premises are true, then the conclusion must be true). So when we talk about reasoning, we are talking about the structure of the argument, not the actual facts used in the argument. This is very, very important. 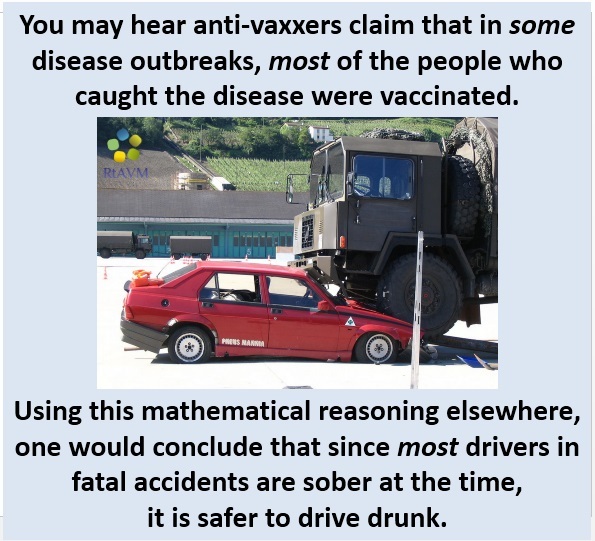 The facts are irrelevant to the reasoning, so you can point out inconsistencies in reasoning by using totally unrelated topics (e.g., driving and vaccines) or even by using hypothetical situations (more on that later). To put it another way, it’s fine to compare an argument about apples with an argument about oranges, just so long as the structure of the two arguments is identical. Notice, the facts being used in the argument are now totally different, but the reasoning or the structure of the argument is identical (note: this particular example is an illustration of a logical rule known as the law of transitive properties). The best way to test for consistent reasoning is to do what I did above. Namely, write the argument as a syllogism, then remove the actual topic of interest and see if the structure of the argument still works for other situations (specifically, other views held by you or your opponent). Setting up analogous situations like this is extremely useful because it eliminates the biases surrounding the actual topic being debated. When you do this, if you can find even one situation in which the structure results in an incorrect conclusion (or a conclusion that you or your opponent disagrees with), then you have just shown that inconsistent reasoning is being used, and the logical structure must be flawed. Remember, an argument with a good structure and true premises will always produce the correct conclusion (more on that here). So if you can find a single example where the premises are true but the structure produces a faulty conclusion, then you know that the structure is bad. Let me illustrate this with a silly example that I have used before. Suppose that I said, “Indiana Jones and the Last Crusade is one of the best movies ever made because Harrison Ford is in it.” This argument claims that Ford’s presence alone is enough to make a movie one of the greatest ever, which seems like a faulty claim, so let’s examine it further. First, let’s put the argument into a syllogism. Now, let’s remove the actual topic of interest. The fact that I do not agree with the argument above means that my reasoning is inconsistent. In other words, I cannot claim that a movie is great just because Ford is in it, because there are movies with Ford in them which I do not think are great. This also illustrates a very important point: arguments like this one make universal claims. In other words, they make claims that must be true all of the time (e.g., all Harrison Ford movies must be great). So anytime that someone makes a universal claim, you only need one example where that claim clearly isn’t true in order to defeat the claim. I want to use one more slightly more realistic example to illustrate how to do this. Consider the following argument. This who are familiar with logic will instantly realize that this argument is a guilt by association fallacy, but simply stating that an argument commits a logical fallacy is, unfortunately, often not enough for people. So pointing out the fact that this argument is inconsistent with other views may be a more useful approach. Again, let’s begin by removing the actual object of debate (i.e., gun control) so that we can see the structure of the argument. Indeed, no matter who you are, you can almost certainly find something that you and Hitler would agree on; therefore, it is completely inconsistent to use Hitler as an argument that something is bad. Also, remember that when an argument is bad, you reject the argument, not the conclusion. In other words, the fact that my gun control example is a bad argument does not mean that gun control is good, because bad arguments tell you absolutely nothing about the conclusion. Indeed, saying that a conclusion is false because the argument is bad is a logical fallacy known comically as a fallacy fallacy. As a general rule, you should try to avoid making modifications like that because it is very easy to accidentally modify it to the point that your example is no longer parallel with the original, but there are situations where it can be useful. When you try to point out inconsistencies in people’s logic, you may receive accusations that you are committing a false equivalence fallacy, so I want to briefly explain what that is and how to avoid it. False equivalence occurs when you assert that two things are the same, when, in fact there is a difference that was overlooked. This generally deals with the facts of an argument, not the structure. In other words, you are saying that two objects are similar rather than two arguments are similar. A common illustration of this is to assert that both cats and dogs are the same because they are both furry. Clearly the fact that they have a few traits in common does not mean that they are the same, because there are differences that were overlooked. Another example would be, “canoes and cruise ships both travel on the water, therefore they are the same.” Does that makes sense? False equivalence generally deals with the objects, not the logic. So if you follow the steps that I have outlined and ensure that the your syllogisms are identical, then you don’t have to worry about committing a false equivalence fallacy. Note 1: False equivalency can also occur if the arguments are not actually analogous but this is less common, at least in my experience, and it can easily be tested for by breaking arguments down to their syllogisms to ensure that they match. Note 2: This fallacy also occurs when you change the meaning of a word part way through the argument. You can find a good explanation of this form of the fallacy here. Now that you see how to test for consistent reasoning, let’s apply the method to some arguments that are commonly used by anti-scientists. Anti-vaccers are very fond of arguing that parents know what is best for their children, and since they are parents, they must be correct that vaccines are bad for their children. To test that argument, let’s run through the steps that I just explained. First, let’s write the argument as a syllogism. Premise one is clearly absurd, but you’re going to have a hard time convincing an anti-vaccer of that. Your only real hope is to show that they don’t use this argument consistently (even if it doesn’t convince them, it will make the absurdity of their argument obvious to anyone else reading the thread). So, let’s remove vaccines from the argument. Notice, as with my Hitler example before, I changed the syllogism slightly, but the structure of the argument is still exactly the same. In other words, the argument revolves around the notion that parents know what is best for their children, and knowing what is best for your children inherently means that you know both what is good for them and what is not good for them. So the structures of the arguments are identical, and if you are going to argue that being a parent automatically means that you know what is best for your child, then you must also argue that Bob knows what is best for his children, even though getting all your meals from McDonalds is clearly a bad idea. Is the problem obvious now? Do you see what I mean by inconsistent reasoning? If being a parent automatically makes you right, then pro-vaccine parents must be right, but anti-vaccers think that pro-vaccine parents are wrong; therefore, anti-vaccers are using inconsistent logic. You cannot say that only parents know what is best for their children while simultaneously saying that pro-vaccine parents don’t know what is best for their children. My religious friends often write off all of the evidence for anthropocentric climate change by simply saying, “Man isn’t powerful enough to change the climate. Only God can do that.” This argument commits a rather blatant ad hoc fallacy, but it also suffers from inconsistent reasoning. I usually point this out with a hypothetical example by asking, “True or false, if man fired every single nuclear weapon that we have, we would create a massive nuclear winter and change the climate?” This invariably gets a knee-jerk response of, “Well I don’t have to answer hypothetical situations” or “CO2 and nuclear bombs aren’t analogous,” but both of those responses are red herring fallacies. Remember, when you are testing for consistent logic, the facts are irrelevant and only the reasoning matters. So if your opponent would disagree with their current reasoning in some hypothetical situation, then their reasoning is inconsistent. Again, let’s walk through the syllogisms to see how this works. This is another universal claim, so if it was true, then the following argument must also be true. Do you see the problem? The structure of the arguments is completely identical. Therefore, if one works, they must both work. You cannot accept one and reject the other. The fact that the situation is hypothetical is irrelevant because the logic is identical. This argument is clearly nuts, and it’s easy to demonstrate that by replacing X with things other than measles. Here are a few fun examples. In each of these cases, you are choosing to get something harmful/undesirable in order to avoid getting that harmful/undesirable thing again, when, in reality, you could just avoid getting it in the first place. As other people have pointed out, getting measles to avoid getting measles is like using pregnancy as a contraceptive. Creationism is, of course, based on the claims that evolution and the Bible conflict, and the Bible must be trusted as the ultimate source of truth (i.e., you can’t use science to interpret the Bible). Even if you believe the Bible, however, that argument is untrue and it is easy to show that creationists are being inconsistent. This argument is inconsistent because of the following argument. The Bible very clearly says that the sun moves around the earth, so you cannot simultaneously claim that creationism is true because the Bible says so while rejecting the idea the the sun moves around the earth, even though the Bible says so (more details on that here). Now, let’s insert the variables from the driving example. As should now be obvious, these two arguments are completely parallel. Either they both work, or neither of them works. Again, the fact that one is about driving and one is about vaccines is irrelevant because it is the structure of the argument that we are interested in, and the structure is identical. On a side note, in some (but not all) disease outbreaks, most of the people who get the disease were vaccinated against it, but that is just because most people are vaccinated. When you look at the ratios, however, the infection rates are far lower among the vaccinated. Similarly, most fatal car accidents involve sober drivers because most people are sober when they drive. When you look at the ratios, however, the accident rates are far lower among sober drivers than drunk drivers (more details here). You must always be sure that you are using logic consistently. When two situations are completely analogous, you must use the same reasoning in both situations. Although it is obviously necessary for all of the facts in your arguments to be true, the topics and facts are irrelevant to the structure of the argument. In other words, two arguments can be completely parallel even if they are about completely different topics. So, when someone points out that your reasoning is inconsistent, don’t immediately reply with a well worn response like, “you’re comparing apples and oranges” because it’s fine to compare an argument about apples with an argument about oranges, just so long as the structure of both arguments is the same. This entry was posted in Rules of Logic, Vaccines/Alternative Medicine and tagged ad hoc fallacies, anti vaccine arguments, creationism, evolution, global climate change. Bookmark the permalink. Wow. I was going to write very nice when I saw the exact words above from Paul Braterman. That is a coincidence for sure but it is two votes for your interesting article.